The above info came from atomofish, and was edited by yours truly (contact me). The image came from groonk.net. 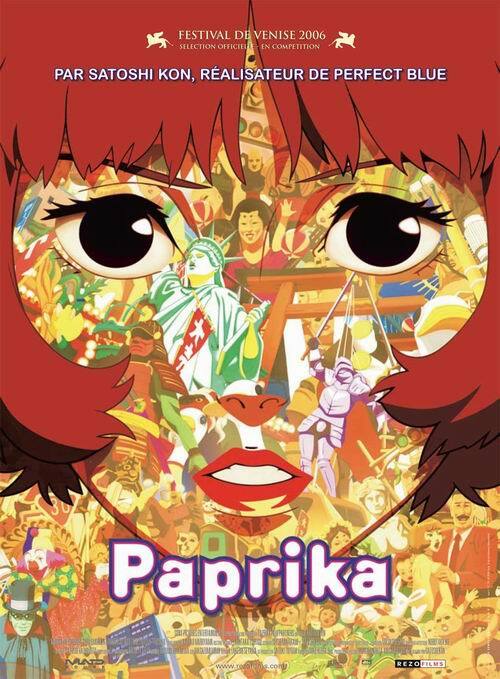 From acclaimed director Satoshi Kon (Perfect Blue, Paranoia Agent) comes his latest brain-twisting mindtrip, Paprika. Dr. Atsuko Chiba is a psychoanalyst with a special secret. She is capable of entering peoples dreams in order to aid patients psychologically. Under her alter ego as the cute psychological detective Paprika, she uses a special machine called the "DC Mini" to travel and explore other peoples thoughts. However, the machine isn't perfect, if the DC Mini isn't used properly, the subject can become insane from the side effects. Her worst fears come true when her project becomes the target of sabotage, and her workers all psychologically affected thanks to a stolen prototype of the DC Mini. Now Atsuko/Paprika must investigate and find out who is behind this plot, and put a stop to it before more people become affected.